Burrito Bears Bento, originally uploaded by sherimiya ♥. Today's bento is a very simple and easy one. It's simply 2 sections of chicken burrito in a lettuce wrap, with steamed broccoli, grape tomatoes, baby carrots and skewered yellow carrot flowers all squeezed into the main compartment of the Ecolunch stainless steel bento box. I like that this box comes with a lidded separate container, which I have used to hold "liquidy" food such as yogurt or cottage cheese, or even extra salsa or sauce. Today it holds slices of Cara Cara oranges, a strawberry, some red grapes and a blackberry. I left the lid of the container off, and just covered with the box lid -- which by the way seals very tightly itself. 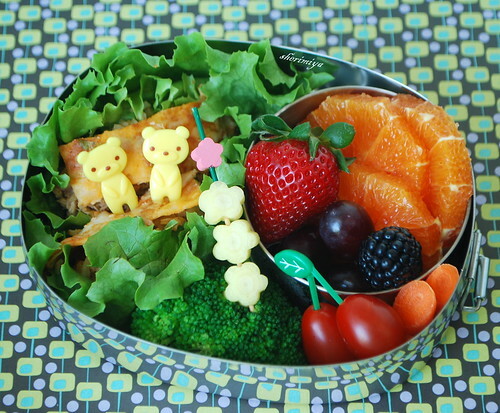 The only cute details in this bento come from the twin bear picks, which MisterMan said looked like they were sitting cutely on a bench together, and maybe the carrot flowers, which took a couple seconds to cut out. An example of how a perfectly fine bento can come together in a minimum of time and effort, still healthy and fresh-looking, on those days when you have way too much to do rather than work on the bento. Oh, and it's Mexican food too! Happy Cinco de Mayo week! Always with the sweetest comments. Thank you, dear Lia! Thanks tatabonita! Grab it quick! cute and perfect as always! hhhmmm I want chicken burritos now! I love Mexican food... one of my favs! P.S. The beet lasagna went down a storm...everyone loved it! A cute pair of bear sitting on the bench in the garden, that is the first thing comes into my mind when my eyes first landed on the photo! So cute! What a healthy and delicious bento. Cheerful and vibrant, and the bench bear friends are just great! Thanks for showing us how beautiful fruits and veggies and a light, creative spirit make delightful yet practical bentos! Do you steam the carrot flowers? Love this bento! I am planning on a Cinco de Mayo bento box for tomorrow as well! Thanks Lil'chan, the skewer -- another easy way to add beauty. Angi, thanks! Me too, had to celebrate with Mexican food. So glad you guys liked the beet lasagna! Cool! Sonoma Bento, I have steamed the carrots flowers before, which obviously makes them easier to skewer, but here they are raw. Either way workds. Look forward to your Cinco de Mayo bento! It looks great indeed! I love how your background is reflected in the stainless steel box... Great to have an inner compartment with it's own lid! I'll be on the lookout for this bento box! Thanks a lot mook. I just noticed that reflection too, and agree! It's a cool effect. Thanks gnoegnoe. It's an Eco Lunchbox. It also comes in a two tier rectangular shape, which I also have. Love them! the bears are a very clever quick accent, and the carrots are so unique -- i have never seen them that pale, i wasn't sure at first if they might be jicama or something! Oh, yeah, sangria! Summertime, woo! The carrots are reflecting the glare from the window; too much light now!